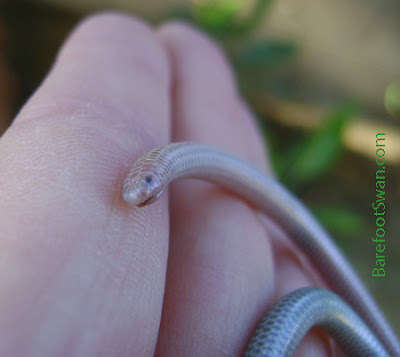 We recently found a Desert Blind Snake in our pool. This is a new species for us, that we didn't realize was living in our yard. As a matter of fact, up until now we didn't even know they exist. Unfortunately these snakes cannot swim, so it was deceased when we pulled it out of the pool. 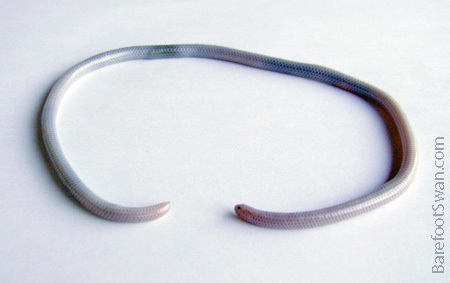 Desert Blind Snakes are also called Threadsnakes. They look like a big earthworm. This one was soft shades of grey and pink. When we looked closer we could see small scales with a thin white outline. The head and tail are similar looking, sort of rounded and blunt. The snake we found was nearly a foot long, and slimmer than a pencil. The young are about 4-5 inches long when they hatch, and adults can grow to be up to 16 inches long. The head is flat, with a countersunk lower jaw that helps the snake to burrow quickly in loose soil. The vestigial eyespots can detect light, but the snake does not have true vision. Desert Blind Snake lives in burrows underground. Its main diet is ants and termites, including their larvae and eggs. 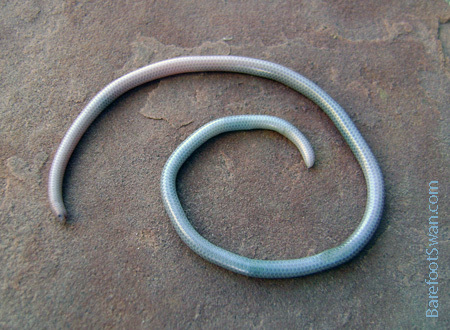 Desert Blind Snake lives in loose soil, in appropriate habitats such as brush-covered, rocky hillsides and in sandy washes. Their range extends from southeastern California into Arizona and south into Sonora and Baja California. The recipe for these bird treats comes from a great little book called For the Birds: Easy-to-make Recipes for your Feathered Friends. We bought the book at Lowe's; it was in their bird seed and feeders department. IMPORTANT: These muffins look pretty tasty when they're done, but they are NOT for human consumption! Combine corn meal, flour, breadcrumbs and baking soda in a medium to large bowl and blend together with your hands. Add currants or raisins, bacon drippings, sand and water. Mix well. Spoon the mixture into a muffin tray lined with paper muffin cups. Bake at 350º for 15 minutes. Serve these muffins on a tray feeder or spear them onto tree branches. In addition to having plenty of recipes for keeping the wild birds in your yard happy, the book also has ideas for building feeders from recycled items, how to deter pests, what to do if you find a baby bird, seasonal hints and and lots of suggestions for feeding success. And there are plenty of photographs, too. This is a Reader's Digest book, distributed by Penguin Group (USA), Inc. If you can't find this book in a local store, you can order by calling (800) 788-6262. The birds in your yard will thank you. We were invited to participate again in the Whitewater Preserve's "A Matter of Taste" Art Festival and Benefit this past weekend (April 13 and 14). The event was held on the beautiful grounds of the Whitewater Preserve, located north of Palm Springs. There were about 20 local artists featured and the works for sale included sculpture, gourd art, photography, illustrations, painting, wood working and lots more. In addition to the art exhibit and sale, there were other activities: making fish prints, nature journaling, a photography workshop, and plenty of hiking. Live music was provided both days by The Shadow Mountain Band. Participating artists each donated a piece of art that was offered in the live and silent auctions, and a "pick your prize" raffle. We contributed a "Bird Lover's Bonanza Basket" which included an Apple Gourd Bird House, a Peanut Butter/Suet Feeder, a block of Suet, and some homemade Mockingbird Muffins. All proceeds from the event support conservation and education at The Wildlands Conservancy's three desert preserves: Mission Creek, Pioneertown Mountains and Whitewater. While we were at the Desert Mountains Art Faire this past weekend, we were fortunate to observe a large number of Blister Beetles swarming over the encelia bushes outside the entrance to the National Monument Visitor Center. The beetles were extremely active - eating, crawling, flying, and procreating. Many were multi-tasking, and all were enjoying their insect version of Spring Break. 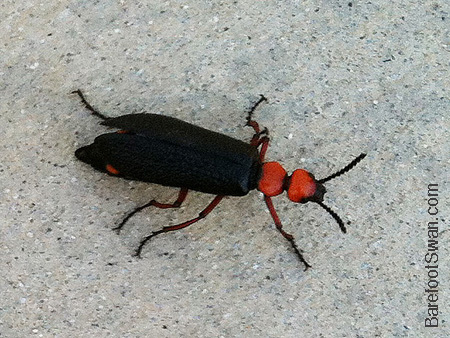 The beetles are large - nearly 1-1/2" long - with a bright red head and prothorax, and a black abdomen. They are ponderous flyers, and their wings create a deep humming noise in flight. With their interesting name and space alien looks, I definitely wanted to learn more about them. Blister Beetles are so-named because they secrete a defensive blistering agent called cantharidin. This compound causes blisters and chemical burns on contact with skin. Cantharidin can be fatal if ingested, and the beetles can be especially problematic when they occur in alfalfa hay that is fed to horses, as accidental poisoning can result. Cantharidin collected from a European blister beetle species has historically been used in the preparation of "Spanish Fly". There are about 7500 species of Blister Beetles world wide, and most of them have bright coloring to warn potential predators of their toxicity. 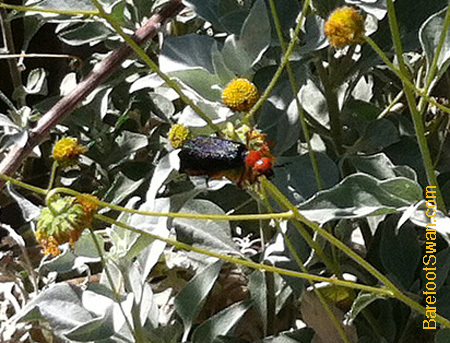 These particular beetles that we saw are the Desert Blister Beetle, or Master Blister Beetle. They occur in southwestern North America and are often seen in swarms in the spring. "If one could conclude as to the nature of the Creator from a study of his creation, it would appear God has a special fondness for stars and beetles."